Eleni Katsantoni provides RNA-sequencing and proteomics data to RD-Connect and is focusing on their integration. 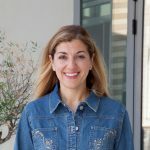 Eleni Katsantoni received her degree in Biology from the University of Athens, Greece, Master of Science in Medical Genetics from the University of Newcastle, UK and PhD in Molecular Biology and Biomedicine from the University of Crete, Greece. Her PhD research focused on globin genes transcriptional regulation and hemoglobin switching. For the period 1999-2005, Eleni worked in the Department of Cell biology, Erasmus Medical Center, Rotterdam, Netherlands, funded by a Marie Curie post-doctoral fellowship (EU) and by Erasmus MC. Her post-doctoral work focused on erythropoetic transcription factors. In 2005 Eleni returned in Greece, supported by a Marie Curie European Reintegration Grant (EU). Her research focuses on mechanisms of transcriptional regulation and she applies transcriptomics, genomics, proteomics and bioinformatics approaches to understand the role of transcription factors in this process. Her projects are funded from EU (FP6, FP7), Research Promotion Foundation (Cyprus) and General Secretariat for Research & Development and Ministry of Education (Greece).